The Londal style represents a unique branch of Norwegian traditional music, distinguished by what Tuddal writer O.J. Rui called "its supple, clean playing style and effortless fingerings." 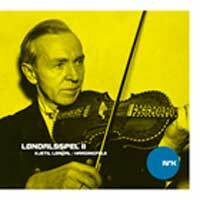 Numerous fiddlers have seen the Londal style as an ideal and emulated its characteristic, lyrical sound. There's hardly a fiddler in Telemark that hasn't been influenced by the Londal style, and this is true for a number of other districts as well.